Looking to build your donor file and wondering whether to invest more in online or offline acquisition? We took a closer look at data from Target Analytics’ recent 2011 donorCentrics Internet and Multichannel Giving Benchmark Report and found some insights into this question. An initial look at Target’s report, which is based on data from 28 large nonprofits, suggests that donors who gave their first gift online (“online-acquired” donors) are proving far more valuable than those who gave their first gift offline (“offline-acquired” donors) – and the advantage increases each year. 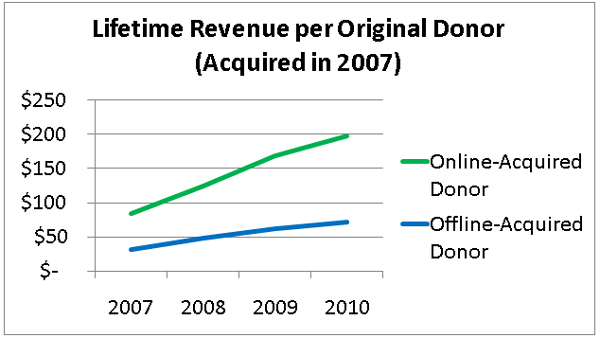 The chart below shows this growth in terms of lifetime revenue of an online-acquired donor vs. an offline-acquired donor. A deeper look at the data reveals that rate of growth of first-year online and offline revenue is actually nearly identical. 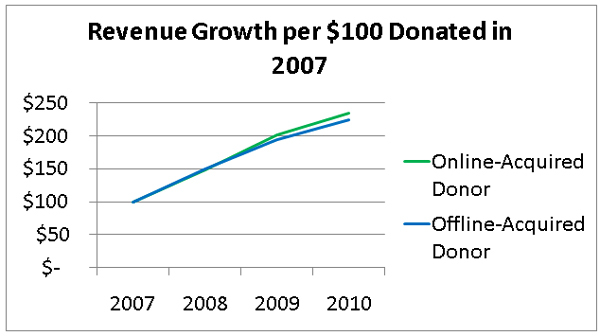 For example, the chart below shows that if we took $100 from an offline donor (or “a pool of offline donors”) in 2007 and $100 from an online donor (or “a pool of online donors”) in 2007, the total revenue would grow at about the same rate – to approximately $230 total by 2010. The difference between the charts is that the chart above looks at revenue growth at the donor level – and online donors have much higher initial gifts and their subsequent gifts are much larger, too. By contrast, the chart below normalizes on dollar basis so both online revenue and offline revenue starts at the same point. The rate of growth using that measure is about the same. In other words, if you made an investment to generate $100 of first-year online revenue, you’d probably gross the same amount of revenue three years out as you would by investing enough to generate $100 of first-year offline revenue. Truth is, when it comes to comparing online and offline acquisitions to see who’s paying off the most, there’s more to consider than the raw dollar amount of money raised per donor. Are your online-acquired prospects continuing to convert to donors after their first year on file? Most likely, yes! M+R has found that these prospects continue to convert to first-time donors even after 12 months, often spurred by a particular campaign of interest, such as a disaster or other high-profile media moment. In fact, the charts above probably under-count the revenue from prospects who joined your list online, because the Target “2007-acquired” data only counts people who made an online donation in 2007. There were prospects who joined lists via an advocacy action or web signup in 2007, gave their first give in 2008, and aren’t being included. What are you really spending on your online and offline acquisitions? When calculating return on investment (ROI), the “investment” portion is critical and extends beyond just acquisition costs to include mail and telemarketing costs, staff costs for email/mail writing and creative, system costs, etc. You should distinguish between variable costs (e.g., the incremental cost of a particular mail piece, call, or email) and relatively fixed costs such as systems or staff costs. We recommend you start by including variable costs in your ROI analysis, as this is where investment decisions should typically be made. At the end of the day, it’s not about picking one channel over another, but rather identifying the best individual sources to invest in, regardless of channel, and how to get the most out of your investment once it’s made. We recommend setting up, tracking and comparing ROI across channels and sources. And, of course, building an effective multichannel program will help you get the most out of your investment.